My first year in Colombia was full of new food, new music, new language, and new friends. Trips to the market and grocery stores were adventures that required advance preparation, such as looking up ingredients in a Spanish dictionary or calling friends to inquire about local terminology. I had studied German in high school, which was no help in a Spanish-speaking country, so it took me a little while. At first I shied away from things I couldn’t identify, but my shopping list expanded as I grew more comfortable with the local foods and the language. 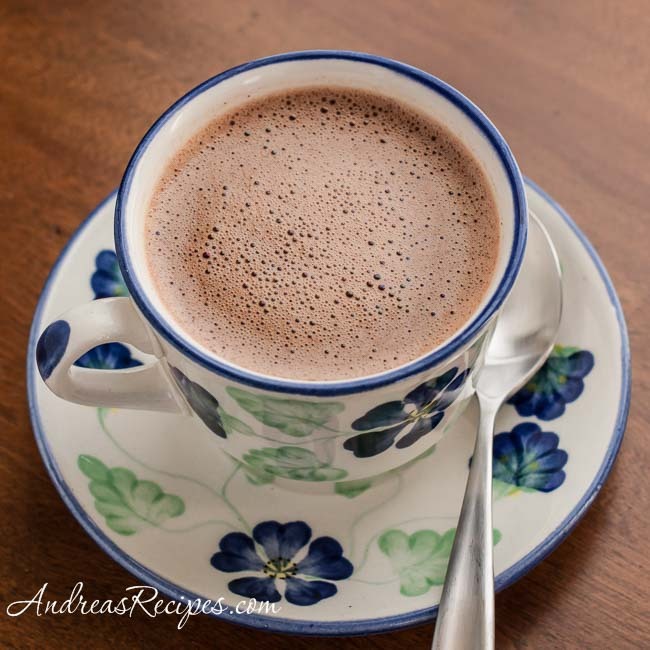 I did learn rather quickly about Colombian hot chocolate and how it was pretty much part of daily life, and I loved to watch it being prepared. 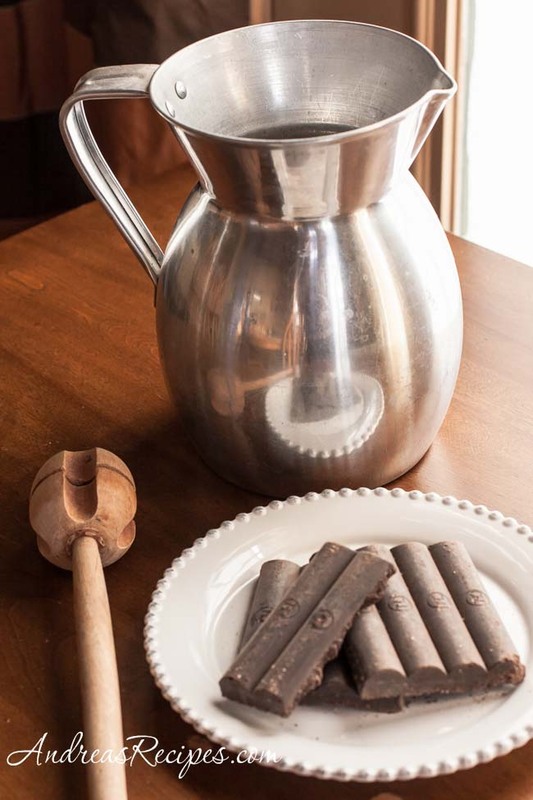 The locals used an aluminum pitcher called a chocolatera to warm milk or water on the stove, then they added chocolate as well as sugar if needed. After the chocolate was melted they would use a wooden molinillo to froth the chocolate. They put the round business end of the wooden stick in the bottom of the pitcher and roll the handle quickly between their hands as if they were trying to start a fire. 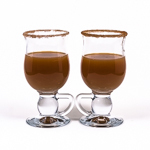 The chocolate would froth up the sides of the pitcher, but the tall round shape that tapered near the top kept the chocolate from splattering over. 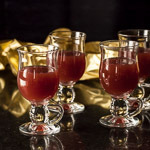 Once it was well-frothed, they poured the steaming chocolate into cups and sometimes gave you a piece of bread and a small chunk of cheese to go with it. Locals dropped the cheese into the chocolate, but I preferred to nibble mine on the side. Colombia was where I learned how good hot chocolate could be, and I bought a large chocolatera and molinillo and still have them in my kitchen. Fortunately I’m able to indulge my Colombian chocolate cravings thanks to the international grocery stores in our area. 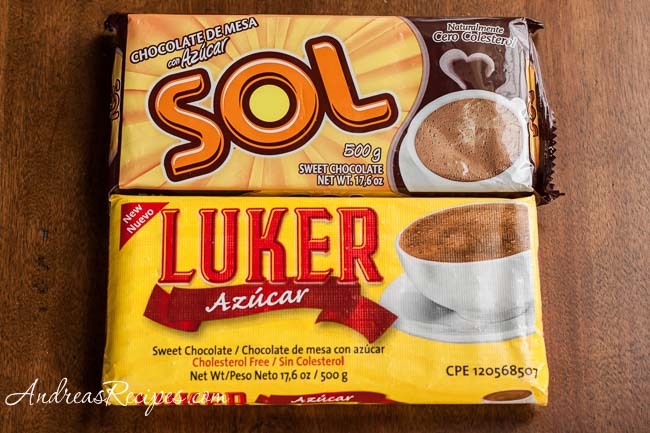 We can find Sol and Luker chocolate from Colombia, both sweetened (con azucar) and unsweetened (sin azucar). Each package has enough chocolate for 16 cups of cocoa, we just break it into individual bars and add one for each cup. The frothing step is rather important for the right texture, and if you can’t find a molinillo you can use a milk frother such as the kind used for making coffee drinks or even a whisk. Warm the milk or water in the chocolatera or small saucepan over medium heat. Once it’s hot, add the bar of chocolate and sugar if needed and spices if desired. Cook stirring until the chocolate completely melts. 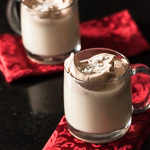 Froth briskly until the chocolate foams, then pour into a mug and serve. I have a friend who loves Colombian food– I will pass this along to her!! And of course, make some for myself 🙂 Looks fabulous!! Andrea, this hot chocolate looks so good. Just what I need right now! A mug of this hot chocolate would taste great now and take off the chill having just come in from walking the frozen streets of Seoul, South Korea. Hi Ivonne, thanks for visiting. I taught at a U.S. school in Bogotá for a couple years. You can find more of my stories about Colombian food on my blog, just click on the Colombian tag in the Blog Index on the right. My wife is from Colombia. Where can we purchase the pitcher. Michael, you can get them at any Colombia store. It’s cheap. Also the “Molinillo” is better known as “Bolinillo” and in Medellín, Chocolate is made with Agua de Panela not with water alone. How much chocolate is “one bar”? Bars come in all different sizes.